Ten graduates of the NIU College of Education sported something new when they crossed the stage during the Dec. 15 and 16 commencement ceremonies. 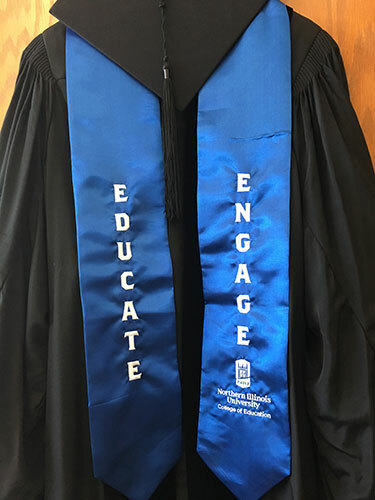 Blue stoles emblazoned with the words “Educate” and “Engage” boldly conveyed that the students took full advantage of the life-changing experiential learning opportunities offered through the college’s Educate and Engage Program. 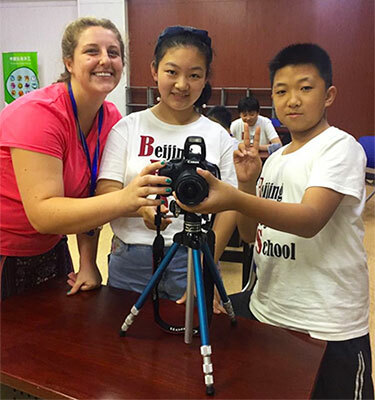 Qualified students each completed a minimum of 144 clock hours – travel not included – in at least two distinct settings. They also received transcript notation through NIU’s Engage PLUS program, on which Educate and Engage is modeled. Seven were Elementary Education majors: Sadie Filipski, Quasha Graves, Laura Koterbski, Nina Mission, Alexis Moaton, Amanda Pankowski and Moesha Swanigan. Special Education majors Catherine Carlson and Ashley Santiago, along with Amirah Daval, a graduate student in the M.S.Ed. program in Kinesiology and Physical Education, rounded out the 10. Among those values are diverse, real-world learning opportunities and collaborations with schools, communities, agencies and businesses that expand local and global avenues for learning, research, service and leadership. “Our Educate and Engage stoles signify to the students, their colleagues, their parents, their professors and their professional staff members that these students have gone way beyond what was required as they sought out engagement experiences locally, nationally and internationally,” Walker says. Locations for an immersion of practice are found throughout the northern Illinois region, from Texas to North Dakota and from Indiana to Colorado and around the world in China and Sri Lanka. Hours earned through school-coordinated projects, registered student organizations or self-arranged volunteer activities that are beyond requirements for core classes qualify. Places of service can include, but are not limited to, libraries, hospitals, clinics or other settings where students can validate engaged learning. Recipients of the stoles clearly understand the worth of this work, says Jennifer Johnson, director of Teacher Preparation for the NIU College of Education. Portia Downey, the recently retired former coordinator of Professional Development for the college, agreed.